GUTHRIE, Okla. – It’s only fitting that Trevor Brazile’s record-tying 18th ProRodeo world championship came inside the Lazy E Arena. The arena that was built for steer roping was home to most of Guy Allen’s 18 gold buckles, so Brazile tied “The Legend” on Saturday night in the grandest of fashions – he won the 10th go-round with the fastest run of the Clem McSpadden National Finals Steer Roping and earned his fourth Steer Roping World Championship, which matches his heading, three tie-down roping and 10 all-around gold buckles. “It’s special anywhere, but especially where I really got started,” said Brazile, whose 9.0-second run in the final g0-round helped him stave off three-time champ Rocky Patterson for the first world championship of the 2013 ProRodeo season. “I was a student of this game before I ever started team roping or calf roping. All those years of roping, practicing, pretending have paid off quite well for the King of the Cowboys, the only three-event National Finals qualifier in the sport who is on a one-way street toward his 11th all-around gold buckle – Brazile has qualified for the Wrangler National Finals Rodeo in both tie-down roping and team roping, where he will head for another world champion, Patrick Smith. But his greatness in the roping box came through in this two-day championship. Brazile won four go-rounds and earned an event-best $26,462. He finished his season with $84,221, just a little more than $4,000 ahead of Patterson, the 2009, ’10 and ’12 world champ from Pratt, Kan. In fact, Patterson held a $1,108 lead over Brazile heading into the final go-round. “Anybody that says there’s no pressure in that situation is a liar, because all the miles we go, all the years of preparation … the chances of gold buckles are so few and far between that you don’t want to mess those up. Brazile knew he needed to put the pressure on Patterson, who was the last to rope. After JoJo LeMond of Andrews, Texas, posted a 9.4 and Joe Wells posted a 10.3, Brazile realized he needed to be fast. “When I saw the round was getting tough, I was really kind of thankful, because it was kind of playing into my deal,” Brazile said. “I thought, ‘If I can get in front of one of those, then they’re going to have to go at it.’ I also couldn’t fold right there either. It was also quite a memorable weekend for 41-year-old Tony Reina, who, in his first qualification to the Clem McSpadden, won the average championship, roping and tying down all 10 steers in a cumulative time of 142.2 seconds. First round: 1. J.P. Wickett, Sallisaw, Okla., 11.8 seconds, $5,077; 2. JoJo LeMond, Andrews, Texas, 12.3, $4,077; 3. Rocky Patterson, Pratt, Kan., 13.0, $3,077; 4. Joe Wells, Cisco, Texas, 13.9, $2,077; 5. Cody Lee, Gatesville, Texas, 14.2, $1,077. Second round: 1. 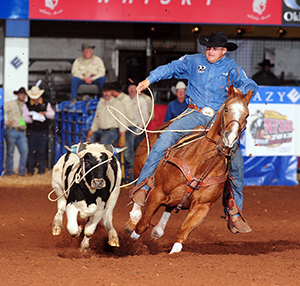 Trevor Brazile, Decatur, Texas, 11.9 seconds, $5,077; 2. Scott Snedecor, Fredericksburg, Texas, 12.3, $4,077; 3. Tony Reina, Wharton, Texas, 12.4, $3,077; 4. Jess Tierney, Hermosa, S.D., 12.9, $2,077; 5. Bryce Davis, Ovalo, Texas, 13.8, $1,077. Average leaders: 1. Tony Reina, Wharton, Texas, 27.8 seconds on two head; 2. (tie) Scott Snedecor, Fredericksburg, Texas, and J.P. Wickett, Sallisaw, Okla., 27.9; 4. Jess Tierney, Hermosa, S.D., 28.0; 5. JoJo LeMond, Andrews, Texas, 28.2. Third round: 1. J.P. Wickett, Sallisaw, Okla., 11.3 seconds, $5,077; 2. Jess Tierney, Hermosa, S.D., 11.4, $4,077; 3. Trevor Brazile, Decatur, Texas, 11.6, $3,077; 4. Rocky Patterson, Pratt, Kan., 12.1, $2,077; 5. Bryce Davis, Ovalo, Texas, 13.7, $1,077. Average leaders: 1. J.P. Wickett, Sallisaw, Okla., 39.2 seconds on three head; 2. Jess Tierney, Hermosa, S.D., 39.4; 3. Rocky Patterson, Pratt, Kan., 42.1; 4. Tony Reina, Wharton, Texas, 43.7; 5. JoJo LeMond, Andrews, Texas, 43.9. Fourth round: 1. Trevor Brazile, Decatur, Texas, 10.5 seconds, $5,077; 2. Tony Reina, Wharton, Texas, 11.1, $4,077; 3. Jess Tierney, Hermosa, S.D., 11.5, $3,077; 4. Scott Snedecor, Fredericksburg, Texas, 11.7, $2,077; 5. Cody Lee, Gatesville, Texas, 11.8, $1,077 Average leaders: 1. Jess Tierney, Hermosa, S.D., 50.9 seconds on four head; 2. J.P. Wickett, Sallisaw, Okla., 54.5; 3. Tony Reina, Wharton, Texas, 54.8; 4. JoJo LeMond, Andrews, Texas, 56.2; 5. Cody Lee, Gatesville, Texas, 58.4. Fifth round: 1. Dan Fisher, Andrews, Texas, 11.2 seconds, $5,077; 2. J.P. Wickett, Sallisaw, Okla., 11.8, $4,077; 3. (tie) Scott Snedecor, Fredericksburg, Texas, and Joe Wells, Cisco, Texas, 12.2, $2,577 each; 5. (tie) Tony Reina, Wharton, Texas, and Mike Chase, McAlester, Okla., 12.3, $538 each. Average leaders: 1. J.P. Wickett, Sallisaw, Okla., 66.3 seconds on five head; 2. Tony Reina, Wharton, Texas, 67.1; 3. JoJo LeMond, Andrews, Texas, 68.8; 4. Cody Lee, Gatesville, Texas, 72.3; 5. Chet Herren, Pawhuska, Okla., 104.1. Sixth round: 1. J. Tom Fisher, Andrews, Texas, 10.8 seconds, $5,077; 2. Rocky Patterson, Pratt, Kan., 11.1, $4,077; 3. J.P. Wickett, Sallisaw, Okla., 11.8, $3,077; 4. Jess Tierney, Hermosa, S.D., 11.9, $2,077; 5. Scott Snedecor, Fredericksburg, Texas, 12.3, $1,077. Average leaders: 1. J.P. Wickett, Sallisaw, Okla., 78.1 seconds on six head; 2. Tony Reina, Wharton, Texas, 83.7; 3. JoJo LeMond, Andrews, Texas, 85.0; 4. Cody Lee, Gatesville, Texas, 86.3; 5. Chet Herren, Pawhuska, Okla., 120.7. Seventh round: 1. Trevor Brazile, Decatur, Texas, 9.3 seconds, $5,077; 2. J. Tom Fisher, Andrews, Texas, 10.5, $4,077; 3. Dan Fisher, Andrews, Texas, 11.2, $3,077; 4. Vin Fisher Jr., Andrews, Texas, 12.3, $2,077; 5. JoJo LeMond, Andrews, Texas, 14.2, $1,077. Average leaders: 1. JoJo LeMond, Andrews, Texas, 99.2 seconds on seven head; 2. Tony Reina, Wharton, Texas, 99.5; 3. Cody Lee, Gatesville, Texas, 105.1; 4. Chet Herren, Pawhuska, Okla., 136.2; 5. Trevor Brazile, Decatur, Texas, 69.6 on six. Eight round: 1. Scott Snedecor, Fredericksburg, Texas, 10.2 seconds, $5,077; 2. Joe Wells, Cisco, Texas, 11.1, $4,077; 3. JoJo LeMond, Andrews, Texas, 11.2, $3,077; 4. J. Tom Fisher, Andrews, Texas, 11.6, $2,077; 5. Bryce Davis, Ovalo, Texas, 12.1, $1,077. Average leaders: 1. JoJo LeMond, Andrews, Texas, 110.4 seconds on eight head; 2. Tony Reina, Wharton, Texas, 113.3; 3. Cody Lee, Gatesville, Texas, 119.1; 4.Chet Herren, Pawhuska, Okla., 151.3; 5. Jess Tierney, Hermosa, S.D., 97.5 on seven. Ninth round: 1. Jess Tierney, Hermosa, S.D., 9.9 seconds, $5,077; 2. J. Tom Fisher, Andrews, Texas, 10.9, $4,077; 3. Trevor Brazile, Decatur, Texas, 11.6, $3,077; 4. (tie) Scott Snedecor, Fredericksburg, Texas, and Mike Chase, McAlester, Okla., 11.9, $1,577 each. Average leaders: 1. Tony Reina, Wharton, Texas, 128.0 seconds on nine head; 2. Cody Lee, Gatesville, Texas, 131.8; 3. Chet Herren, Pawhuska, Okla., 170.3; 4. Jess Tierney, Hermosa, S.D., 107.4 on eight; 5. JoJo LeMond, Andrews, Texas, 110.4. 10th round: 1. 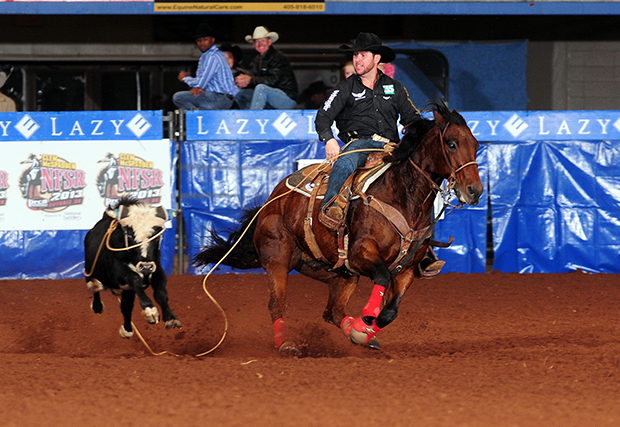 Trevor Brazile, Decatur, Texas, 9.0 seconds, $5,077; 2. JoJo LeMond, Andrews, Texas, 9.4, $4,077; 3. Joe Wells, Cisco, Texas, 10.0, $3,077; 4. J.P. Wickett, Sallisaw, Okla., 11.1, $2,077; 5. J. Tom Fisher, Andrews, Texas, 12.1, $1,077. Average: 1. Tony Reina, Wharton, Texas, 142.2 seconds on 10 head, $15,231; 2. Cody Lee, Gatesville, Texas, 145.5, $12,231; 3. JoJo LeMond, Andrews, Texas, 119.8 on nine, $9,231; 4. Jess Tierney, Hermosa, S.D., 120.0, $6,231; 5. Chet Herren, Pawhuska, Okla., 170.3, $3,231. World standings: 1. Trevor Brazile, $84,220.86; 2. Rocky Patterson, $80,162.43; 3. Cody Lee, $68,977.42; 4. JoJo LeMond, $64,971.09; 5. J. Tom Fisher, $60,412.13; 6. Scott Snedecor, $59,645.86; 7. Chet Herren, $58,791.24; 8. J.P. Wickett, $57,123.58; 9. Tony Reina, $56,306.42; 10. Jess Tierney, $54,715.48; 11. Dan Fisher, $50,997.26; 12. Vin Fisher Jr., $50,925.69; 13. Joe Wells, $46,503.99; 14. Bryce Davis, $35,790.66; 15. Mike Chase, $29,490.12.